A great attraction of touring the mountains is their sense of timeless beauty, offering visitors a window into the land’s distant past. California’s peaks and valleys have changed little since the United States annexed the future state from Mexico in 1848, or even since the nation’s founding in 1776. 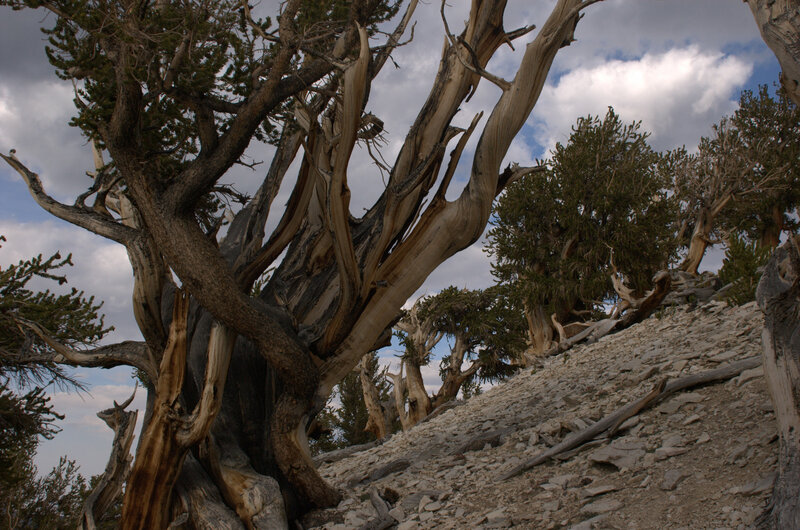 Nowhere does that ageless wonder feel stronger than the Ancient Bristlecone Pine Forest. Here the journey of Columbus is a current event and the Great Wall of China is a recent construction project. Some of these marvels, aged but still growing, have stood longer than the great pyramids of Egypt. 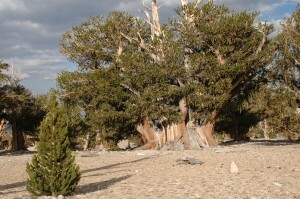 Bristlecone pines in the Inyo National Forest rank as the world’s oldest trees, some more than 4,000 years in age. Anyone with an appreciation of geography or natural history will appreciate hiking through a part of the world largely unchanged since 2,000 B.C. The experience is certainly worth a detour for those already traveling east of the Sierra Nevada mountains. Two hikes from Schulman Grove enthrall visitors. 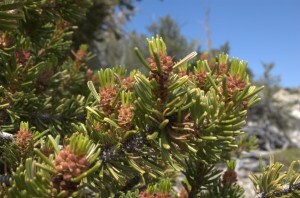 The one-mile Discovery Trail tours an impressive area of bristlecones in a short and easy loop. Those who are physically able, though, may prefer the 4.5-mile Methuselah Walk through the largest and densest concentration of pines in the forest. This two-hour hike also features Methuselah, believed to be the world’s oldest tree at 4,844 years young, in an area called the Forest of the Ancients. How do the trees survive and reproduce in such a high and arid environment? Why do they thrive in some parts of the forest but not in others? What finally kills the pines, and what happens next? Interpretive booklets and trail markers answer these and many other questions. Consider the weather and elevation before choosing a hike. Schulman Grove stands at 10,000 feet above sea level, where thunderstorms erupt suddenly and many find the air thin and dry. Another attraction of the forest is White Mountain Peak, the state’s third-highest summit at 14,246 feet. This is California’s most easily-attained peak exceeding 14,000 feet, with a rocky dirt road leading to the summit and a high-elevation trailhead. But hikers, especially those inexperienced at high altitudes, should still proceed cautiously. From Schulman Grove, drive 16 miles north on a mostly-unpaved forest road to White Mountain Peak Trailhead. This bumpy ride will take at least an hour, but delivers riders to an uncommonly-high launching point at 11,680 feet. Many camp at the trailhead, where there’s a parking area and pit toilet. Be sure to take time to enjoy the stars; they’re big, bright and countless at this elevation. From here to the summit is a seven-mile trek which gains 2,566 feet. The ascent is gradual until the last hour, when climbers reach the mountain’s switchbacks. Along the way, hikers pass by a University of California research station. They will also probably see scores of marmots and may even spot a herd of wild bighorn sheep. At the summit, an awesome view of the Sierra Nevada mountains to the west rewards trekkers on clear days. Many consider this the best panorama of the Range of Light anywhere. To the east, one can see deep and far into the Nevada desert and the Great Basin. To the south, Death Valley looms. Those who start early enough to enjoy a sunrise here will not be disappointed. Most hikers will double back and finish the trip in a day, because there are few attractive camping spots on the route. More importantly, there’s no water. Be sure to bring an adequate supply for a long hike without shade. On the drive back, those hungry for more can hit the Patriarch Grove for two more short and rewarding hikes, and probably few other hikers enjoying them. Both the Timberline Ancients Nature Trail and Cottonwood Basin Overlook Trail are favorites of photographers, especially in the sunrise hours. At this 11,000-foot perch lives The Patriarch, the largest known bristlecone pine, gnarled and knotted from centuries of growth. As I admired it, I noticed a nearby sapling only a few feet tall, just beginning its own growth and journey through time. Examining the young tree, I realized that the bristlecone pines are more than a bridge to the past. They also connect us to our future. Whatever awaits us in the centuries or even millennia to come, these enduring wonders could still be here. Getting there: From Highway 395 in the town of Big Pine, drive east on Highway 168 for 12 miles. Then turn north on White Mountain Road, driving 11 miles to Schulman Grove where the visitor center, Discovery Walk and Methuselah Walk are located. Continue north on the road – from here it’s mostly unpaved – to reach Patriarch Grove or White Mountain Peak Trailhead. Drivers should not attempt to take trailers or large vehicles like motor homes on the unpaved portion of White Mountain Road. The road is usually open from mid-May through November. For current road conditions, call 760-873-2500. Supplies: Bring a generous supply of food and especially water. 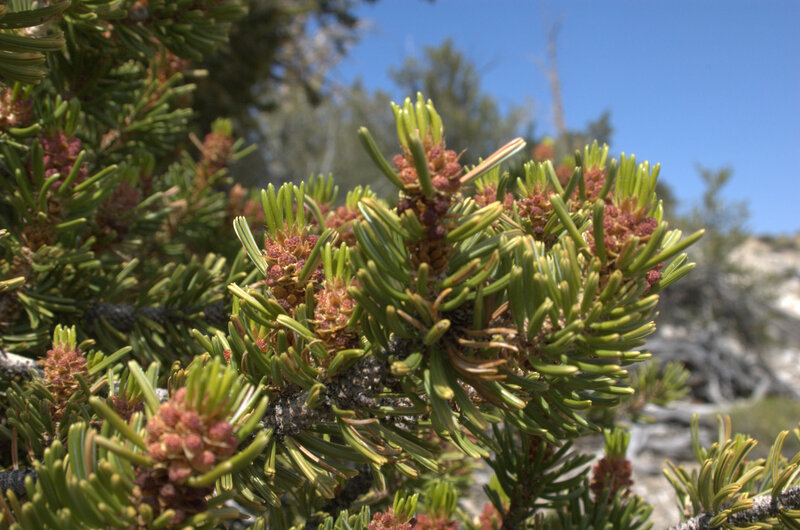 Neither is available at the Ancient Bristlecone Pine Forest. Hats, sunglasses and sunscreen are all indispensable. Camping: The Grandview Campground, a few miles south of Schulman Grove, has no-reservation sites available on a first-come, first-served basis. There’s no water or garbage service. The sites are free, though the Forest Service requests a $3 maintenance donation. Altitude: Because of the forest’s high elevation, visitors coming from sea level should hydrate well and avoid undue exertion. Those hiking to the summit of White Mountain Peak should consider spending at least one night at altitude in advance of the trek. For more information: Visit www.fs.fed.us/r5/inyo.